All rights reserved. No part of this publication may be reproduced, stored in a retrieval system, or transmitted in any form or by any means, electronic, mechanical, photocopying or otherwise, without the prior permission of the copyright owner. Applications for such permission, with a statement of the purpose and extent of the reproduction, should be addressed to the Director, Publications Division, Food and Agriculture Organization of the United Nations, Via delle Terme di Caracalla, 001000 Rome, Italy. In July 1935 my wife and I set out from Amherst, Massachusetts, on our first trek to Europe. We sailed out of Montreal on the S.S. Duchess of York, and late in the afternoon of the first day we passed the city of Quebec, which offered us a striking view of the Chateau Frontenac perched on a bluff high above the St. Lawrence River. We had no premonition that, within just over ten years, World War II would have been fought, or that in the aftermath of that war the representatives of many nations would have gathered in the Chateau Frontenac on 16 October 1945 to found the Food and Agriculture Organization of the United Nations (FAO). Neither did we have any way of knowing that this new Organization would have a pervasive influence on much of the remainder of our lives. During most of 1943 and early 1944 I served for my Government as a consultant on animal breeding in China and India. 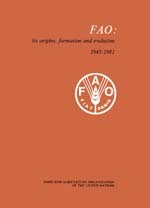 As I was nearing the end of my assignment a colleague in the United States Embassy in Chungking showed me the one copy the Embassy had received of the Report of the Hot Springs Conference, by which I learned of the impending formation of FAO, and it sparked my interest. Back in Washington, during the summer of 1944, the United Nations Interim Commission on Food and Agriculture was already busy preparing materials for consideration by the Quebec Conference. I was drafted into assisting the Technical Committee on Agriculture, and met with it on many occasions over the next eight or nine months. My experience in China and India had also sparked my interest in the problems of breeding livestock under unfavourable environments, and during 1944–45 I was preparing a manuscript on this subject. The Interim Commission officer who later became FAO's first Director of Information learned of it, and asked if FAO might publish it. Thus it eventually appeared as FAO's Agricultural Study No. 1. Soon thereafter, FAO Director-General Sir John Boyd Orr decided to convene in Copenhagen, in the late summer of 1946, just prior to the Second Session of the FAO Conference, the first session of a Standing Advisory Committee on Agriculture preparatory to the setting up of FAO's Agriculture Division. It was during that Committee session that I was invited to join the FAO staff. So, from those earlier involvements that I have Just recounted, did I become inexorably involved in FAO's web. Now, as perhaps the only one remaining in FAO whose experience has covered almost the whole span of the Organization's creation and development. it has seemed appropriate — indeed, an obligation — to record the key events of those years. for the information of those who have and will come on the FAO scene at later stages. This volume is the result. Land and Water Development Division. Human Resources, Institutions and Agrarian Reform Division. Fishery Information, Data and statistics service.